All horses must be presented in order to get registered or approved. Ponies can be registered, if they have an official registration paper issued by an European pony association or an approved US pony association and a proof of pedigree of at least three generations. 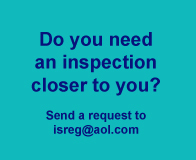 Pony inspections will be conducted at the same sites as ISR/Oldenburg NA inspections. For detailed information and the Tour Schedule check in the Main Menu the topic INSPECTIONS. ISR Pony foals will get the ISR Pony brand on the left hip. The ISR Pony brand is a small ISR brand.